Gold is up over 15% this year so far, while the gold stocks (per XAU index) have risen over 50%. But investors are skeptical about this year's gold rally, and that's a good thing. For the past several years, we have seen strong rallies in gold and gold stocks early in the year, only to see the market reverse and end the year down. Investors are reluctant to jump on board this year's rally. There are certainly reasons to think that gold could correct. After all, we have seen a very strong rally, with the strongest February on record; it would be foolhardy to expect that to continue without a pause. The first quarter is seasonally strong, with the April to June period typically soft. Moreover, the speculative net-long positions on the COMEX have increased vastly in recent months, and thus are vulnerable to profit taking. But there are strong reasons for thinking that we have further to go this year. —interest rates remain very low, with negative rates encompassing over 20% of the world's GDP, and Fed Head Janet Yellen discussing negative rates in the U.S.
—though stocks are up 50% this year, they are still significantly below their 2011 highs (over 70% on the XAU), while valuations remain very low on an historical basis. (See chart above.) Other than most of 2015, the mining stocks remain at multi-decade lows against bullion. I suspect there will be a pullback in the weeks ahead, but it is likely to be shallower and shorter than "normal" seasonal corrections, certainly than those of the past couple of years. And after this pullback, gold will recover to move higher this year. We have seen the lows in the long gold bear-market (or super-cycle bull correction, which is how I prefer to view it). 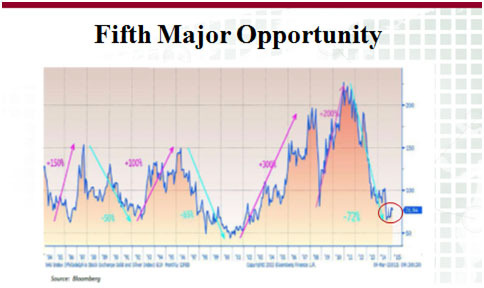 Since the mid-1980s, in fact, there have been five such strong buying opportunities for gold stocks, after the XAU has dropped by 50% or more. Each occasion saw stocks move at least 100%, and as much as 300% thereafter. (See figure 2.) This is another such great opportunity to invest in gold stocks. Given the probability of a pullback, what should you do? 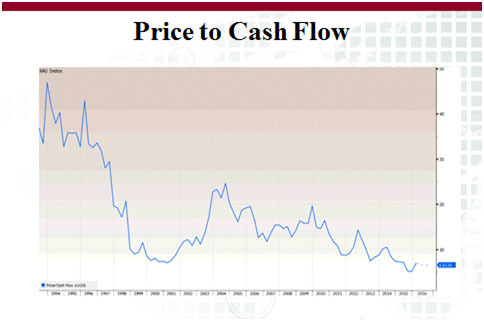 If you are a long-term investor, disinclined to trade, and you own good quality companies, just hold. However, this would be a good time to lock in some of the recent strong rally. It would do no harm to have some cash on hand to buy in any correction or any new "stories" that come along. I would say that most of major gold stocks are a little overbought in the short term and subject to a pullback. What you do depends on your individual situation, not only your overall portfolio and risk tolerance, but also the individual stocks you own. If you are overweight in gold, start by selling the lower-quality companies, even if they have not moved so much. If you have significant positions in particular stocks, then by all means trim those positions, perhaps giving you the opportunity to buy it back at a lower price on a correction, but in any event having some cash for overall corrections. 2) From time to time, Streetwise Reports LLC and its directors, officers, employees or members of their families, as well as persons interviewed for articles and interviews on the site, may have a long or short position in securities mentioned. Directors, officers, employees or members of their families are prohibited from making purchases and/or sales of those securities in the open market or otherwise during the up-to-four-week interval from the time of the interview until after it publishes.